There is an old adage (meaning: a proverb or short statement expressing a general truth) that says: “Birds of the same feather flock together.” This is perhaps the reason why groups like the G20 and V20 were conceived and actually organized. In the international brotherhood of nations, there is a group that call themselves the “Group of Twenty” (also known as G-20 or G20) which is an international forum for the governments and central bank governors from 20 major economies. These countries are: Argentina, Australia, Brazil, Canada, China, France, Germany, India, Indonesia, Italy, Japan, South Korea, Mexico, Russia, Saudi Arabia, South Africa, Turkey, the United Kingdom and the United States together with the European Union. Founded in 1999, the objective of the G20 is to study, review and promote high-level discussion of policy issues pertaining to the promotion of international financial stability. The G20 controls and account for 85% of the gross world product (GWP). On the other hand, the V20 is composed of the finance ministers from countries most vulnerable to climate change. “V” actually stands for “vulnerable”. Organized in October 2015, the group includes some of the world’s smallest and poorest countries aims to marshal resources their nations’ resources in the fights against the impact of global warming and climate change. As opposed to the G20 which are developed and advance economies, the V20 are underdeveloped and developing economies. The V20 member-nations are Afghanistan, Bangladesh, Barbados, Bhutan. 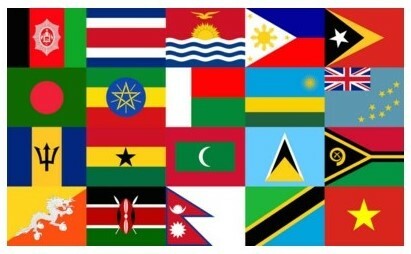 Costa Rica, East Timor, Ethiopia, Ghana, Kenya, Kiribati, Madagascar, the Maldives, Nepal, the Philippines, Rwanda, Saint Lucia, Tuvalu, Vanuatu and Vietnam. The purpose and objectives of the V20 are: (1) the organization of the V20 to enable vulnerable countries to steer a high-level policy dialogue pertaining to action on climate change and the promotion of climate resilient and low emission development with full competence for addressing economic and financial issues among nations around the world, rich or poor; (2) promote alternative economic and financial visions to shape global debate and policy development in response to climate change and seek to drive global economic prosperity in harmony with the Earth’s climate and its most vulnerable communities; and, (3) the platform to achieve these objectives through: (a) acting collectively to promote the mobilization of public and private climate finance and other resources of climate finance; (b) sharing and exchanging best practices on economic and financial aspects of climate action; (c) developing improved and innovative approaches to climate finance; and (d) engaging in joint advocacy and other collective actions. Aside from the obvious economic statures, the stark difference between G20 and V20 nations is their ability to cushion the effect of climate change which has definite monetary cost. And financial resource is one thing the G20 has in abundance while the V20 has less of. Having stated this, the G20 could be “birds of the same feather” when it comes to domestic resources management and international trade. However, in the realm of environmental management (particularly global warming and climate change), both G20 and V20 now become “birds of the same feather”… nations that share and have the same problem. It is therefore important for both the G20 and V20 to also share resources in fighting the effects of global warming. Again, climate change do not recognize between G20 and V20.